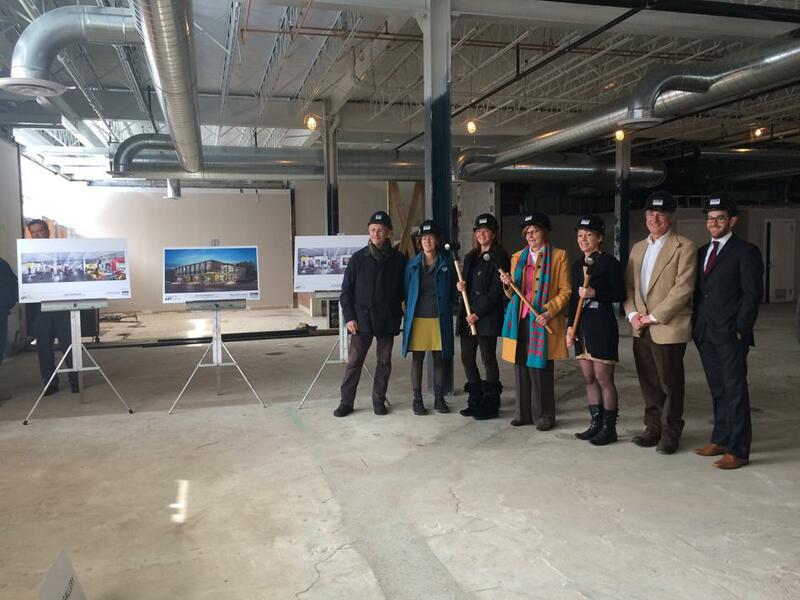 City officials, architects working on the new Evanston Art Center and center employees pose with sledgehammers and hardhats at the site’s groundbreaking Thursday. The new center, located on Central Street, is scheduled to be completed by early May. After three years of fundraising and searching for a location, the Evanston Art Center board broke ground Thursday at its new location at 1717 Central St.
Builders from The Dobbins Group, the architecture and construction firm responsible for renovations of the space, began preliminary construction earlier in the week, putting up steel framing for walls on the second floor of the future art center. Around 30 art center staffers, city officials and donors attended the informal event, perusing and discussing building plans with The Dobbins Group president Tom Dobbins and some of his architects and builders. Norah Diedrich, the art center’s executive director, and Tess Lickerman, the center’s board president, gave brief opening remarks, followed by comments from Mayor Elizabeth Tisdahl and Ald. Jane Grover (7th). Paula Danoff, the director of development and communications for the center, said she was especially enthralled by the proposed gallery space, which will feature large windows and sliding doors to provide a cohesive flow between exhibits. The center is currently housed in the Harley Clarke Mansion, a nearly 90-year-old house on the lakefront where the art center has resided since the late 1960s. This space poses limitations for artists looking to display their work, with minimal wall and gallery space available, Danoff said. Diedrich said she feels nostalgic about her history at Harley Clarke but looks forward to the opportunities the new space presents. The new arts center is slated to be finished by the beginning of May with the center’s spring benefit scheduled for May 16, a deadline both Dobbins and Diedrich said could be ambitious. Diedrich expressed particular concern for the possibility of poor weather conditions slowing construction.